(Bloomberg) -- As talks between U.S. President Donald Trump and North Korea’s Kim Jong Un flourished last year, South Korean leader Moon Jae-in enjoyed international praise for bringing them together. Now that they’ve split, he’s facing pressure to get them back to the table. Trump’s decision to walk away from his Hanoi summit with Kim continues to reverberate a month later in Seoul, where Moon has come under fire from the conservative opposition for accepting the North Korean leader’s disarmament pledges. The Kim regime has hit him from the other side, withdrawing staff from a new joint liaison office last week and criticizing South Korea as “cowardly” for backing his U.S. allies’ stance against easing sanctions. Moon has repeatedly had to play the role of mediator since he took office in May 2017 amid escalating threats of war between Trump and Kim. The long-time advocate of reconciliation with North Korea has staked much of his presidency on his ability to put the two men on the path to peace, including a surprise trip north of the border to meet with Kim and help rescue their first summit last year in Singapore. 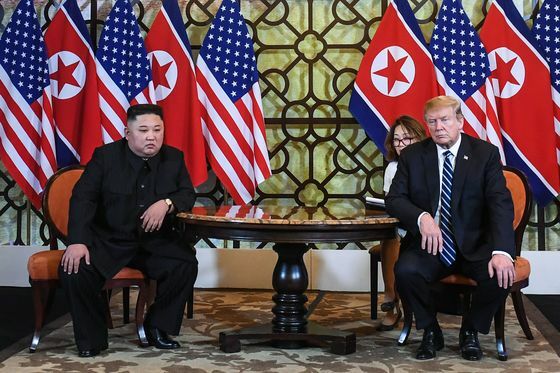 The failure of the Hanoi meeting on Feb. 28, however, raised new doubts about what such summits will accomplish, with Trump administration officials suggesting they’re willing to wait out North Korea as it languishes under sanctions. With few options short of resuming weapons tests that might provoke Trump, Kim has instead signaled a willingness to threaten Moon’s diplomatic progress. North Korea has directed its ire at South Korea in a string of commentaries since the summit, accusing it of undermining the cooperation agreements Kim and Moon signed in April and September. “South Korea holding onto these sanctions is the same thing as putting shackles on its own hands,” the propaganda website Uriminzokkiri said Monday. On Friday, North Korean officials withdrew from a liaison office South Korea set up six months ago on the northern side of the border. While a handful of North Korean staff returned to the office on Monday, the message was delivered. The collapse of talks has further pushed back Moon’s plans to bring Kim to Seoul for the first-ever visit by a North Korean leader, a trip originally planned for last year. It’s also energized South Korea’s anemic opposition, fueling critical floor speeches by conservative lawmakers and editorials by right-leaning newspapers. “There’s nothing as embarrassing as North Korea trying to ‘train’ our country by going back and forth with their options to leave or come back to the office,” Liberty Korea Party spokesman Min Kyung-wook said Monday. 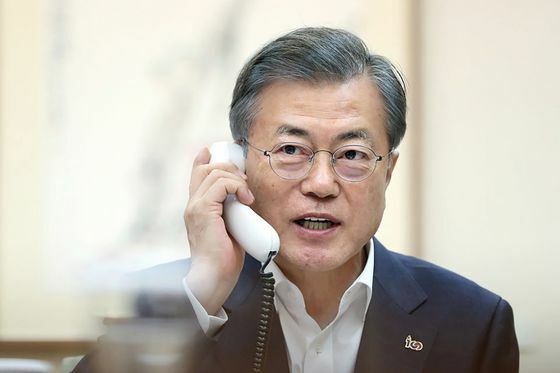 Moon’s approval rate ticked up 1 percentage point to 45 percent in a Gallup Korea poll last week, after falling to a record low of 44 percent in the previous survey. The president himself has said little about North Korea since the immediate aftermath of the summit, when he praised Kim’s offer to dismantle a key nuclear production complex as an “irreversible” disarmament step, splitting with the Trump administration’s assessment. Trump has signaled some flexibility on his position. Last week, he intended to reverse sanctions imposed on two Chinese shipping companies accused of violating North Korea trade prohibitions -- until officials in his administration persuaded him to back off and then devised a misleading explanation of his vague tweet announcing the move, according to five people familiar with the matter. What Moon can do to bridge the gap between Trump and Kim remains to be seen. Since the summit, North Korea hasn’t responded to South Korea’s repeated requests for working-level talks, let alone any one-on-one meetings. Kim could be holding out for some signal that Moon will either press Trump for concessions or take his own unilateral steps to restore economic ties. South Korea has been pressing for the resumption of two inter-Korean projects in North Korea -- a joint factory park and a mountain resort -- that have been frozen due to political acrimony, as well as joint rail and energy projects. Such steps are unlikely because it would undermine South Korea’s alliance with the U.S., which has guaranteed the country’s security for almost 70 years.